When open the IE browser by clicking a "Record Test Case" button, the Recorder addin is shown, as described in your video. However once I navigate to any page (either by writting the url to address bar or by clicking on a bookmark), the Recoreder addin disappears. This issue occurs on my present workstation with Windows 7 64bit and IE 9.0. The StresStimulus is executing the 64bit version of the IE. I've tested it also on Windows XP 32bit and the problem has not occured there. To give you a more definite answer, I need a little more information. Is the problem is just with disappearing the recorder, meaning that fiddler continues to capture the traffic from IE? If this is the case, then the issue is caused by IE hiding the recorder. Sometimes webpages open different IE windows, where the recorder is not visible. Also, in IE9 on Windows 7, if you navigate from trusted to non-trusted domains or vice versa, IE may lunch another instance in a different process. 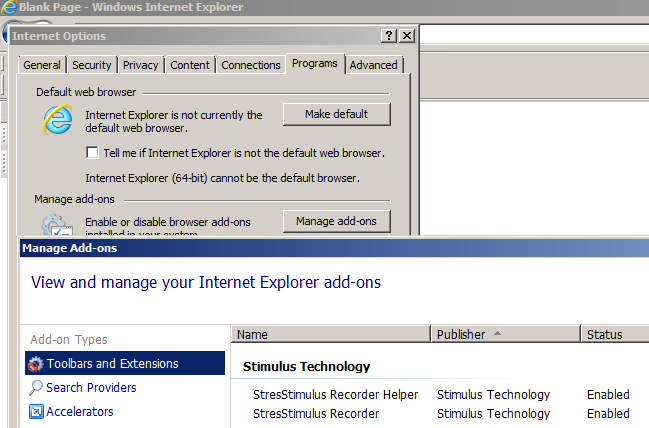 To display the recorder, make sure the StresStimulus recorder is checked in the IE Menu -> Explorer bars, as shown below. Also, before you use the recorder, run Fiddler "as administrator", to see if it'll fix the issue. Finally, even if you do not see the recorder, StresStimulus will continue capturing your test case. To complete the recording, either close IE, or click "Stop recording" in StresStimulus. On the other hand, if in addition to recorder disappearing, fiddler stops capturing the traffic from IE, then it is a security issue. Running Fiddler "as administrator" before you use the recorder should fix this issue. Also, make sure that the StresStimulus Recorder Helper and StresStimulus Recorder add-ons are enabled, as shown below. Thank you for the answer. The "run as administrator" mode has helped. I'm ashamed that I've not figured it out by myself. the issue really did not occur for sites in the "local intranet" zone. Anyway, using the "run as administrator" mode is sufficient for me. Thanks for your answers. 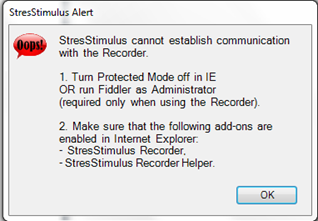 StresStimulus displays the following error message in cases when the communication with the recorder is not established within 30 seconds. It actually suggests running fiddler “as administrator” or turning off the IE protected mode. Based on your feedback, in the next StresStimulus build we will changed 30 seconds to 20 seconds, to makes it easier to detect this issue. (Can't make it too much shorter, because IE opening takes time). Based on you answer, I will count this issue resolved, and will move it to the Support Questions Forum.